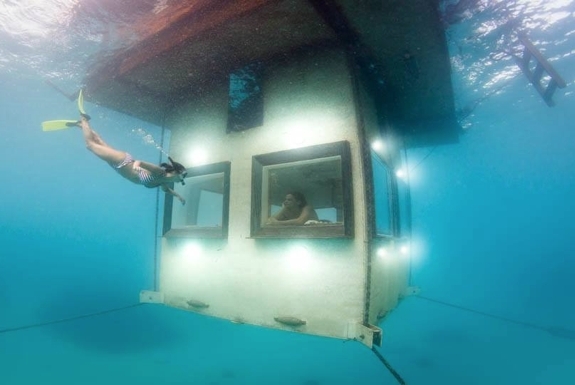 Any review of the Manta Resort’s Underwater Room has to start, well, underwater. That’s where the bedroom is located. It’s large enough for a double bed — and virtually nothing else. There’s not even room for stairs. Guests traverse the 4 meters (13 ft.) down to the bedroom via ladder built into the wall. But what the bedroom lacks in furnishings it makes up for with the vista out the windows. 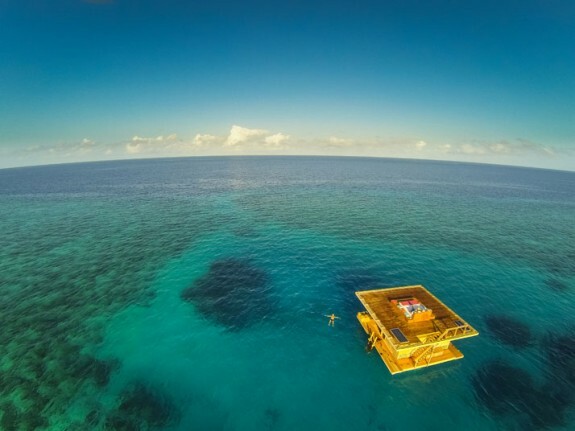 The Underwater Room sits above a blue hole — a 12 meter deep depression in the ocean floor ringed by coral. 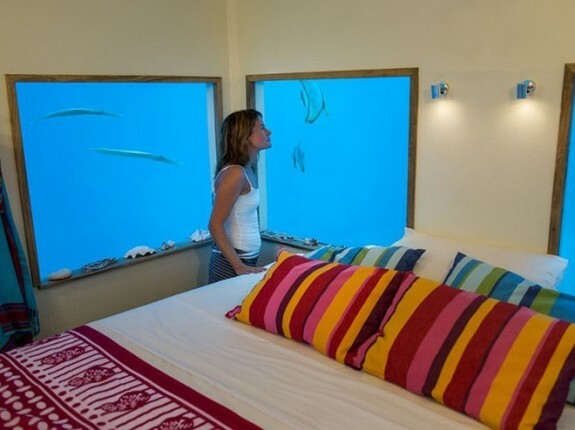 During the day a trickle of fish, eels, octopi, squids and manta rays swim by the windows. 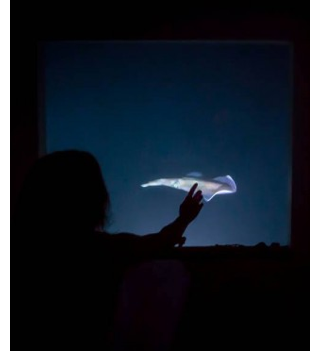 Then, at night the view really comes alive when the spotlights located under each window are turned on, attracting (and illuminating in surreal fashion) all manner of tropical sea creatures. The main floor, at sea level, is where guests tend to spend most of their time. 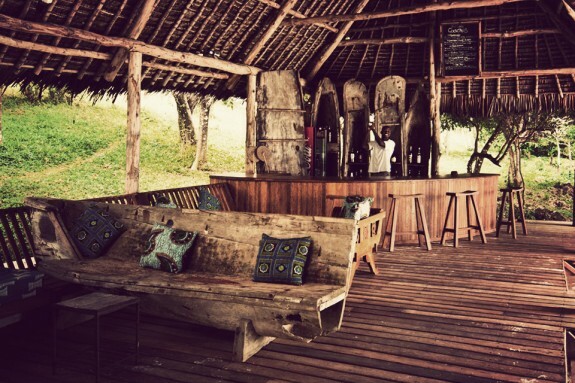 There are cozy lounging and dining areas here as well as an eco-friendly toilet, an open-air fresh water shower and (perhaps most importantly) a fully-stocked bar fridge. The top deck might have the world’s most heavenly queen bed from which to watch a sunset or sunrise. The star watching on cloudless nights is incredible too; some guests prefer sleeping up here rather than down in the bedroom. During the day, the top deck is too sun-drenched to spend prolonged periods. But it does provide a platform from which daring swimmers can jump into the ocean. 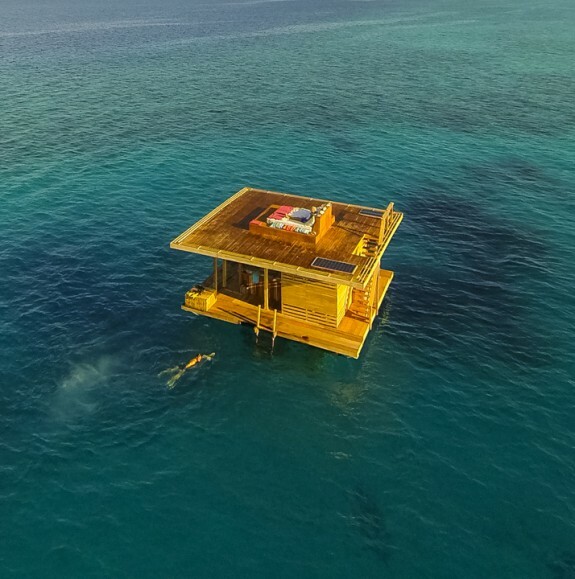 A stay in the Underwater Room starts in a traditionally-carved wooden boat, which transports guests to their accommodations anchored 250 meters offshore. It’s only a two-minute trip, but leaves you feeling like you’ve arrived in an otherworldly place. It’s all privacy and solitude and quite, save for the gentle waves and the occasional chirp of a bird. 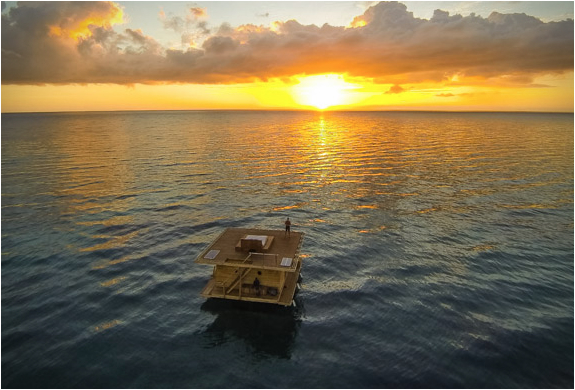 Meals are delivered to you at per-arranged times, but if you need anything else — from a cocktail to use of a kayak — every guest is provided with a mobile phone that will connect you to a dedicated Manta Resort staff member. 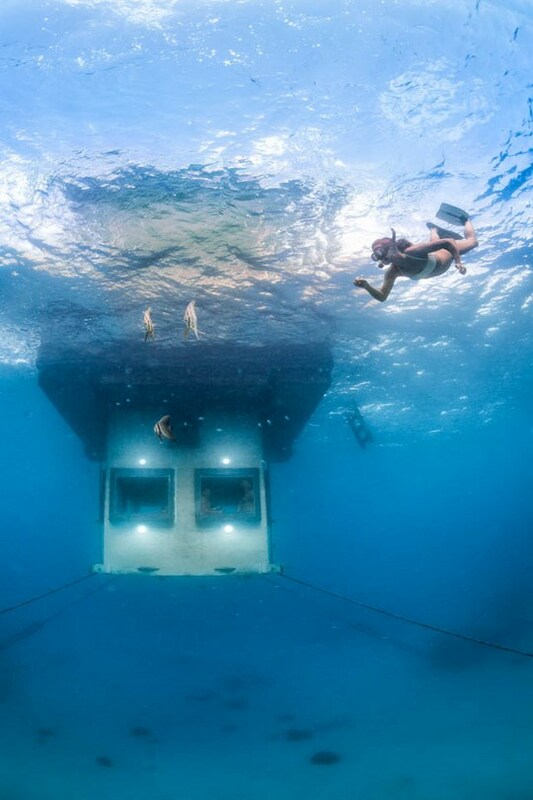 As you almost certainly suspect, a stay in the underwater room doesn’t come cheap: US$1,500 a night for two people or $900 for that solo traveler you really wants to get away from other people. 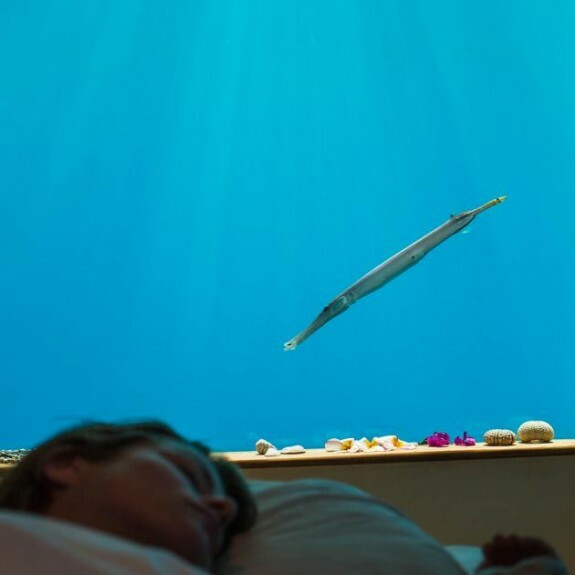 Fortunately, those rates are all (or, mostly) inclusive and low season discounts are available — check out the “Planning your Underwater Room stay” section below for more info. Most luxurious are the six Seafront Villas (pictured right). They’re open and spacious, close to the ocean and feature their own sun terrace. The four Superior Garden Rooms are further back from the water and, being part of a larger building, aren’t as private. The seven Garden Rooms are the smallest and, unlike the above options, don’t have air-conditioning. However, we like them more than the superior rooms. Except for an hour or two are noon, a/c isn’t really needed. Plus, the regular garden rooms are in individual thatched-roof structures and provide some of the feeling of solitude that the villas do. 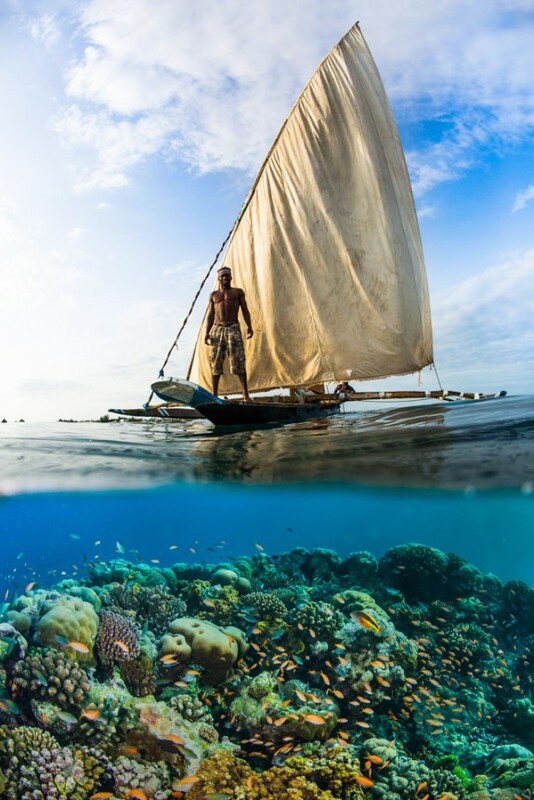 Pemba is often conflated with in with Zanzibar, its better-known sister island to the south. In fact, the two are rather different. Zanzibar is flat, dry and much more populated (both by residents and tourists). 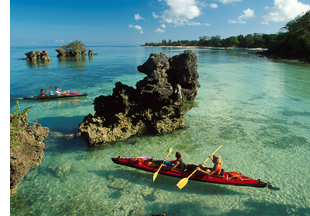 For culture, food and shopping, Zanzibar is the far better travel destination of the two. 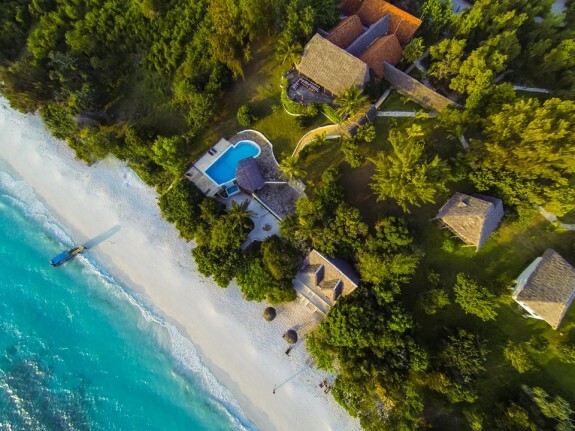 For clear water, outdoor activities and a getting-away-from-it-all feeling, we far prefer lush and hilly Pemba. 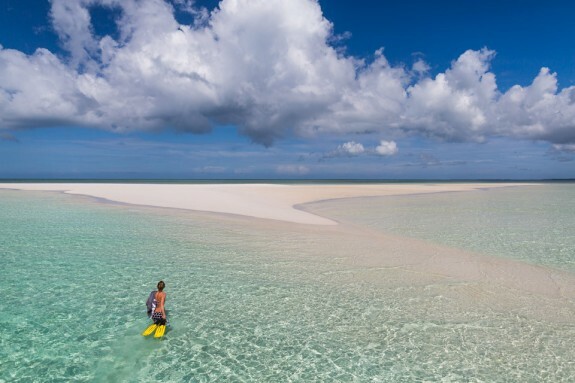 In addition to Manta, there’s one other resort on the island in the high-end category: Fundu Lagoon. We’re huge fans for its shabby chic stylings. You won’t be if you are looking for modern luxuries. 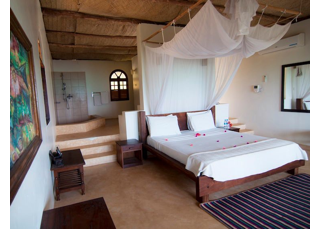 The best hotel option for budget travelers on Pemba is the Jondeni Guest House. It has a friendly vibe and a wonderful deck with ocean views. The guest house building itself has bedrooms that are bland and shared bathrooms that you wish wouldrise to that standard. But then you can’t expect much from a place where rates start from $8 a night for a dorm bed. When: Though the Manta Resort is open all year, the sun and water visibility are best from July until October. During the resort’s official low season — from March 1st to June 30th — room packages are discounted between 10 and 20 percent. Click here for more on the weather patterns off the coast of mainland Tanzania. If you stay: Get ready to climb. Guests need not have Spiderman-like agility, but a certain level of confidence traversing the bedroom ladder is required. With all the facilities on the main level, you’ll be climbing up and down a lot. What’s included: All food and drink is included in the room rate, as well as laundry service and a daily spa treatment. Round trip airfare from Zanzibar is included too, which makes it all the more strange that the extra ground transportation fee to/from the resort will set you back a rather steep US$45 . . . per person . . . one way! Wifi, available in the resort’s main lounge area, is included but is of dubious speed and reliability. Family friendly? Not really. The resort doesn’t go much out of their way to cater to kids. Children under 12 years aren’t allowed in the underwater room. Those under 7 years aren’t allowed at the resort at all. 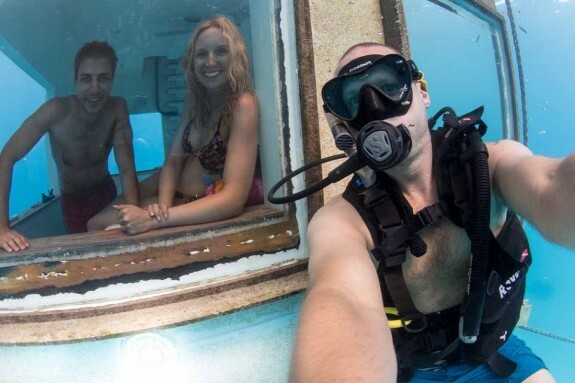 All the photos of the Underwater Room on this page were taken by photographer extraordinaire Jesper Anhede (seen below in what must be one of the world’s great selfies). It took him two weeks — and one remote-controlled flying camera — to get all the shots just right. Though, we can’t imagine he was in much hurry to get the job done. Just wow! Seems totally worth the splurge.